American style pancakes at the weekend is becoming a bit of a habit for me. I had expected these Rhubarb and ginger pancakes to have a bit of a pink tinge, but that was not the case and I wasn't going to add pink dye just for aesthetics. I wanted to enjoy these au naturale. I also noted that the sharp and tartness of the rhubarb did not come through. Maybe I have become accustomed to its flavour. What was really lovely was these pancakes were indeed light, fluffy and quite splendid. We had these with some chopped bananas, the sweet juices of the cooked rhubarb and some Greek yogurt. I have to point out I do not think the Greek yogurt worked well, perhaps I should have stirred a little honey to it. Whisk the flour with sugar, baking powder, ginger and salt. In another bowl, mix together the milk, rhubarb, oil and 1 egg. Then gently fold mixture into dry ingredients until well combined. Add a little oil to a frying pan and gently heat. Then drop in about 2 – 3 tablespoons of the batter for each pancake. Cook pancakes about 4 minutes on each side. Serve warm. Goodness, a pancake which has rhubarb in it has to be heaven sent!! I just love rhubarb & haven't seen it very many times in the market here. I have been thinking of giving it a try in my Winter garden here. Our Summer months can be rather brutal for rhubarb but now that I have seen your recipe I am craving it!!! I really enjoy eating the British classic of rhubarb crumble, but with the weather changing now for the better, I've been trying to think of other ways to enjoy it. So this is the reason I came up with the pancakes. I strongly recommend growing some in your garden, it really is a delightful vegetable. I recently planted some in my garden. PS Should the weather turn tomorrow (cold and rainy) Rhubarb crumble I what I would turn to. Oh Astra. Thank you. I am so pleased you like them. Rhubarb is in season here, so you will see it appearing on most British foodie blogs. If you do make these, I truly do hope you enjoy them. My rhubarb just wasn't as sharp as I would have liked it, but other than that these were lovely. Rhubarb scares me. I'm so unfamiliar with it it's shameful. But to know me is to know that I LOVE pancakes!! And yours look great!! Maybe instead of yogurt next time try pineapple cottage cheese, yum. By the way, the two men in my house said to tell you thank you very much for the recipe of the garlic potato cakes. I made them tonight and it was awesome!! It's so simple, yet so different in taste from regular mash. You're the best!! Rhubarb pancakes are new to yummy,must have tasted heavenly. Clever idea, I would never have thought to use rhubarb in pancakes! My rhubarb is green, so it wouldn't make them pink either. What a great idea for a pancake recipe! Bookmarked! I think its time you conquered your feelings towards the Mighty Rhubarb. I managed to overcome mine a few years ago. Please give it a try - its in season and is wanted to be enjoyed in a humble crumble or even baked and then stirred in Greek yogurt. I have a suggestion for you that will appeal to the American in you. 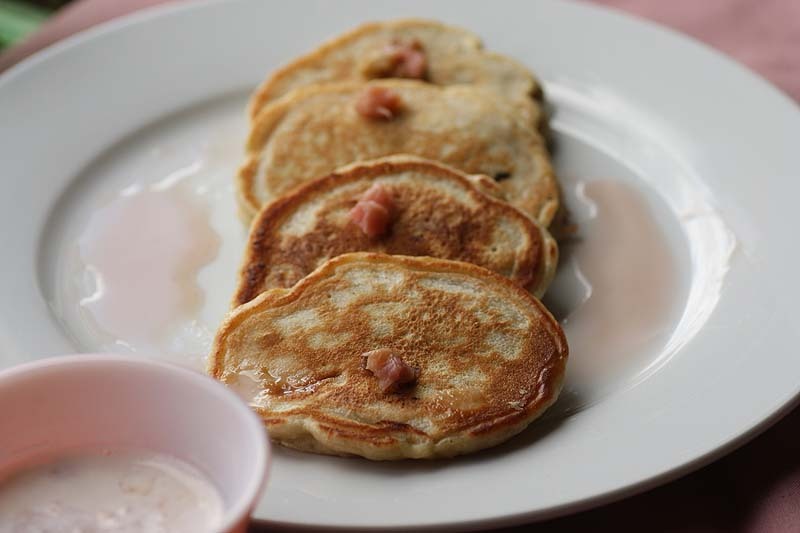 Make these pancakes with half rhubarb puree and half strawberry jam - now that is a classic. Does it sound appealing?! And I am so humbled to read the comment by your two men. Thank you. By the way, did you make the potato cakes with regular garlic, or did you find some wild garlic. Thank you Kiran, they were very good indeed. It occured to me on night as I didn't fancy having a crumble. Then I adapted the 'golden squash' pancake recipe i made in the Autumn last year. 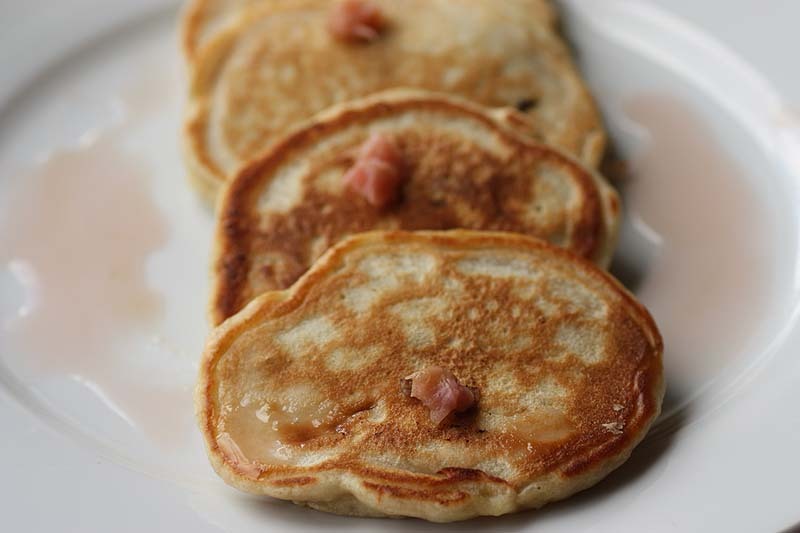 I have noted that there some rhubarb pancake recipes on the internet, but not like mine. So I am quietly smiling to mayself. PS The rhubarb i used was both green and pink, neither of the colours came through the pancakes, but the flavour did - I guess thats what really matters! Thank you so much Maninas. You have no idea how much I am craving these now. Hi I know i haven't been around as much but I am finally making my way around. The kids love their panckaes and i my rhubarb is ready so must give this one a try, sounds ever so delish. I do hope the kids enjoy these pancakes, they certainly are a treat! These are such lovely pancakes!! I am going to make them this afternoon! They look awesome! Hiya! I do have to say rhubarb and stawberry jam does sound appealing, with the Greek yogurt, and pancakes too. Hmmm, I'll give it a try (she says shaking in her sneakers). "By the way, did you make the potato cakes with regular garlic, or did you find some wild garlic." I am so plesed that you like them. I really do hope you enjoy them. appeals to you. Maybe give it a go one of these days - may win you over with rhubarb - which I must admit is an acquired taste. Sneakers is not a word I use often. I grew up in Wales and the word I used for trainers was dappers. Language and slang is certainly interesting at times.